Below are more photos of April’s wonderful tiny home. We don’t see too many gambrel roofs on tiny houses but as you’ll see below, they can really add a lot of interior headspace – especially in the loft. Photo credit to April Anson. 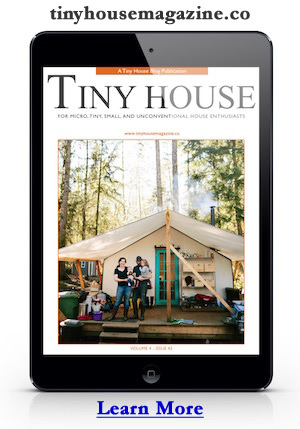 This entry was posted in Tiny Living and tagged april anson, oregon, student. I really LOVE this design. Nice gambril roof. Having a desk with all of the windows around it is fabulous! I’m a big fan of the book shelves as well. I’m wondering if she would be giving away or selling the plans for this tiny house. It is beautiful! Looks very liveable, but two questions: where is the bathroom and where is the cat box? If I’m guessing right, the bathroom is opposite the kitchen, behind the big bookcase. No idea where the cat box is…. I don’t think there is a cat box. If you look at the photos of the out side you’ll see a ‘doggie door’ porch. It seems to lead out from the writing nook. I just love the GAMBREL roof line on this one. I don’t understand why any tiny houses are built with standard style roof lines. Those few extra inches make the loft so much more livable. I understand that it might take a little more ‘know-how’ to build this roof but the pay off is huge when it comes time to live in it for years on end. I would have loved to see the bathroom. I’m a big fan of a tiny tub (1/2 wine barrel will do) and a tiny sink in them. I don’t want to clean tooth paste or the hubsters whiskers from the kitchen sink (yuck) and I may need to give a dog a bath once in a while. Edison looking lightbulb is neat. what’s the watts on that? i forgot to ask. i like your comfortor. where did you get it? did you make it or buy it? it’s got a hippie vibe. This is great! Well designed & appointed. Is the bathroom behind the bookcase? Yes. From the photos on her blog it looks like a wet bath with a composting toilet. This is perfect! EVERY Tiny House needs a gambrel roof!! Very VERY nice! I really like all those windows but the big one in the end wall up top is extra nice. Loving the extra loft headroom too. How do I get the plans to make this home? I’m very interested. Its a perfect size and can go anywhere! I’m not sure where she got the plans. I plan to add a gambrel roofed home to the plans I offer, but no ETA. I’ll reach out to her and find out if her plans are available. I was going to put a shed roof on my place but now I’m wondering how much harder it would be to put on a sort of half gambrel instead. Hellloooo! I just stumbled across this page, but thank you so much for all your kind words! I do love the tiny, and have been living in it for 2 and a half years now. There is no cat box – I joke that it is the cats’ house that they let me live in, but in reality they go outside through the cat door which is under the desk 🙂 . I don’t have a composting toilet (mine is an RV style), but would definitely recommend composting to anyone looking to build/buy. As for plans, we just bought the $90 Tumbleweed basic plan and changed it based on the materials we could find. The gambrel roof is AMAZING – I would never ever do a gabel roof unless the whole thing had dormers. The only trick with the gambrel is we had to make the trusses ourselves from a homemade jig. It was a little intimidating, but turned out to be fairly easy and no major mistakes. I have to admit, that gambrel roof sure looks like a gem on this house and most that I have seen it on. Too bad, it would look like hell on mine and I don’t think the city would allow it but man the interior shouts class, the whole package is beautiful. Would be interested in reading your paper and getting your perspective. This is a stunning work. I strongly suspect it will be a “classic” of the movement in years to come. Does she have the plans available for download or purchase? I love this tiny home. It’s perfect. This is, by far, the most appealing tiny home I’ve seen. Very nice – the roof is great. Would like to see pictures of the bathroom. What a sweet tiny home. I love how you added plants to the small loft. I also love your rustic broom! Exquisite space. I love the handmade broom and those lovely large windows and the incredible paneling throughout. Love your house and the fuzzy little kitty also. Congrats! Awesome little home! May be a stupid question, but how does the toilet work? Like an RV? Once again, very nice and cozy! Good job to you both. I am so happy you pulled this off. For the past two years I have been searching the web for a tiny house with a barn roof. It’s perfect! It’s exactly what I had pictured. My kids ar grown now and this is the direction I am heading in. I believe we are all on a journey and you are ahead of the game. Thanks for sharing your wonderful home with the world. As for the paper, it was just published in book form. The full citation is: “‘The World is My Backyard’: Romanticization, Thoreauvian Rhetoric, and Constructive Confrontations in the Tiny House Movement.” _From Sustainable to Resilient Cities: Global Concerns/Urban Efforts_. Research in Urban Studies. Bingley: Emerald P, 2014. 289-313. Love your design, April!!! It’s practical, efficient and gorgeous!! !